Many people have heard of the STEM program but not everyone knows exactly what it entails. STEM is a curriculum based on the idea of educating students in four specific and critical areas — science, technology, engineering, and math — however, STEM does not separate these subjects to be taught individually, rather they are integrated into a cohesive program that teaches the subjects together as compliments to one another. One key point that the program is praised for is its use of real-world applications to train these students for their future careers — making it one of the most successful programs resulting in some of the best-prepared students facing the workforce upon graduation. More often than not , people think of high school or even college as the starting point for such technical and complex education to begin, but many schools have incorporated STEM into classes to some degree from kindergarten on up through high school! Of course, it is much more basic at the lower grades, but by including it in the curriculum in students’ education from the beginning and adding to it incrementally as they grow, students will be much more interested in the subjects included in STEM. In addition to this, they will be able to notice the correlation between these subjects, which will possibly result in higher numbers of these individuals choosing STEM-related careers. 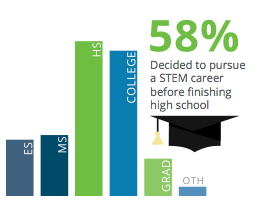 As you can see to the left, 58% of people currently working in STEM decided on this career path prior to graduating high school, meaning that early teaching is critical in creating future workers interested in STEM. STEM is the second fastest-growing industry, second only to healthcare, with an expected 8.6 million jobs available in the field by 2018. Not only are graduates of STEM-related majors some of the highest paid young professionals right out of college, but they also get those high-paying jobs rather quickly following graduation. While these facts may be enticing, it is important for individuals to know about some of the potential successful careers they could have in their main area of interest when it comes to STEM. Science and engineering careers are the most related when it comes to the workforce and make up 6 of the top 10 careers in STEM including civil engineering, environmental engineering technology, nuclear engineering technology, computer engineering (also related to technology), petroleum technology, and marine sciences. Among the requirements for these careers are strong problem solving skills, chemistry, basic math skills, and deductive and mathematical reasoning. Mathematics itself, while an integral element in each of these careers, is not well represented in this top 10 list, making up only one of the listed STEM jobs. Despite this face, Mathematics encompasses a multitude of industries such as statistics, actuarial sciences, economics, and more that differentiate it from its fellow STEM categories. Required skills for mathematically related jobs include deductive and mathematical reasoning, problem solving skills, and facility with numbers. If you love numbers and are interested in STEM, this might be the career path for you. While science, engineering, and mathematics combine to make up the majority of the top jobs in STEM, technology is one of the fastest growing of these already rapidly rising industries and it affects its STEM counterparts significantly. Advancements in existing technology, like smart-phones and computers, as well as the development of new technologies, such as IoT devices and connected car security, make it very apparent that a career in technology has a bright outlook for the future. Jobs are becoming much more technical now and require a better understanding of technology, so STEM programs have been more heavily emphasizing this segment of STEM in recent years. Of Monster’s top 10 most valuable STEM careers, there are four related to technology: computer and information services, computer engineering (also related to engineering), computer programming, and the #1 most valuable STEM career: information technology. For these careers, there are multiple job titles including Information Security Analyst, Computer Systems Analyst, and Web Developer, among others. These jobs not only require knowledge of the latest technology, high analytical and developmental skills, and logical thinking, but a person seeking one of these jobs must be goal-oriented, passionate, and dedicated to advancing technology and growing the industry as he or she rises throughout a career in tech. A common misconception about STEM is that it is all about the technical and analytical side of these complex careers, but STEM workers are also creators, innovators, and ground-breakers for the futures of each of their industries. Another fallacy surrounding STEM is that a student must receive traditional training and education in order to gain a successful career in STEM; however, there are alternative ways into a career in these fields. Many people may look at the training and schooling necessary to attain a STEM-related degree and think that it is not affordable for them or the resources necessary to achieve such certifications required for their future careers are out of reach; however, there are companies out there that try and alleviate these fears by offering alternative routes for those individuals who are interested in a career in technology, but choose to go a different route to get there. Axiom had the privilege earlier this year to work with IT Works, a Tech Impact program that offers free, immersive IT training to young adults– motivated high school graduates, age 18-26 years old, who have not yet completed a Bachelor’s degree. As part of the 16-week training program, an IT Works student named William Lewis, completed a 5-week internship with Axiom and you can read about his experience interning for Axiom through IT Works here. A career in STEM is not necessarily about going to the highest ranked technology school, but being motivated enough to find your own way to where you want to be in your career, with them help of some companies out there who can get you where you’re headed. With such a revolution in science, technology, engineering, and mathematics, the modern world is in great need of such advanced, pioneering minds as those interested in having an impact on these crucial subjects. If you’re interested in learning more about STEM careers, please contact Axiom at https://www.axiomcyber.com/ to speak to one of our IT professionals about a career in tech. If you are in need of a different route of gaining technological experience and qualifications, please visit http://techimpact.org/ to learn more about their available programs for innovative and motivated individuals.